Our top pick for containers, small gardens and the edible landscape. Attractive, compact plants grow just 24-30 inches tall and produce 3-5, pink-red pods at a time—and, when picked regularly, they just keep producing. For optimum flavor and texture, pick pods when they are 3-4 inches long. Pods are excellent roasted, grilled, tossed in stir-fries, and in gumbos and jambalaya. French Quarter Pink Okra Hybrid can also double as an ornamental. It has an open, compact habit with handsome foliage and creamy yellow flowers. 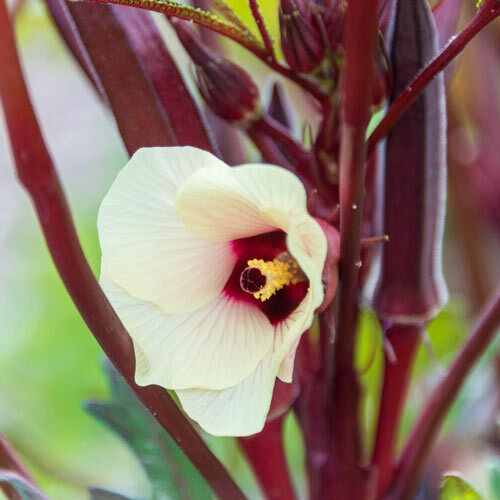 For best results, sow okra seeds in a sunny location after the weather is warm and all danger of frost has passed. 50-55 DAYS. Spacing15-18 inches between plants, 36-48 inches between rows. FruitPink to pinkish-red fruits are best when picked at 3-4 inches long. Soil RequirementsRich, well-drained sandy loamy soil. pH 6-6.8. Seed CountApprox. 50 seeds per packet. CommentsAttractive fruit on a dwarf, compact plant. 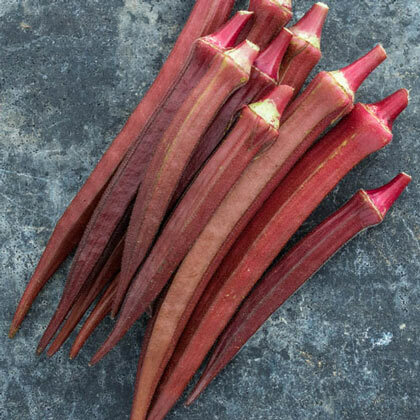 This okra produces pink to pinkish-red fruit that is best when picked at 3-4 inches long. Pick regularly for continued production. Creamy lemon flowers look pretty against the handsome foliage. The plant has an open, compact habit, and grows happily in the ground or a container.